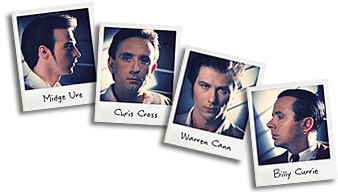 Hi all, I have most of the early Ultravox! vinyl, including the very rare Tiger Lily single in pic sleeve, VGC. Also the first 3 albums, and early singles (incl Young Savage, RockWrok, Retro EP), all pic sleeve vinyl on Island. I am thinking of putting it all up on eBay. I'd be grateful for any idea from you out there on what the interest might be. I've been searching high and low for the Tiger Lily single with the picture sleeve with the band on the front!! Is this what you have? That sleeve would be very rare. More common (but still rare-ish) is the "shop dummy" sleeve. Yeah, I've seen that one on eBay a couple of times. That's the re-release, isn't it? Still not what I'm looking for though! If I can ever get my hands on the one with the band on the front, I'd be a very happy woman. I thin you're right Mrs. The shop dummy sleeve is the one I have, which is the Dead Good Records re-release. I only paid about £4 for it. The tracks are the other way round,too. Which one are you thinking of auctioning, lhs? People dont seem to bid highly for ultravox items but there is always some intrest in them. For example, any standard vinyl album only sells for about £5 - £20, but it nearly always sell's. Having said that, six weeks ago a 'frozen ones' germany 7" sold for about £60, so there should be even more intrest and money for a band picture version of 'tiger lily single For the dummys one im not too sure. I own both versions of the Tiger Lily single. The one with the group shot is harder to find as the other one , which you can find from time to time on E-bay. My Group shot version I found on the US E-bay site . BTW. : I own two copies of the Frozen ones single. One is with the picture sleeve and the other not. The one without the sleeve I would give away. I would do a trade or you can get it for a reasonable price. I know about the high prices on Auctions for this single but this is not for my interest. I would love the thought a real fan would it incl. in his sample. So if anyone will have it - feel free to E-mail me. tha´s one of three which are still missing in my collection! I do have the one without the PS! Sorry all for my delay in replying. I thought that I would receive an e.mail notification of any replies to my post. I didn’t. Anyway, yes, this is the original in the pic sleeve. It’s Mint. I think I played it once. I’ve got almost all of the early stuff, including the album that for me marked their downward spiral, ‘Systems of Romance’. just lost out on the tiger lily single on ebay, so if your thinking of putting it on ebay there would be interest. OK, I will put it on, got some other stuff too, early punk. I'll be back & post a link to the Listings as soon as I get round to putting them on eBay. Maybe in a month or 2. Anyone can e.mail me if more info req'd meanwhile. Thanks.